Most Canadians will now have seen the striking image of Brigette De Pape. The determined solitary young woman, surrounded by the highest ranking public officials in the land, stood in silence holding her crumpled ‘Stop Harper’ sign, as the Governor General read the Conservative government’s throne speech. Reaction has been swift and strong. Brigette DePape has been criticized for her disrespect of a time-honoured tradition. Liberal Senator Sharon Carstairs questioned why the intelligent young DePape would jeopardize a promising future. Liberal MP Carolyn Bennett said Brigette should have taken her protest out “on the lawn”. Jason Kenney, Conservative MP and Minister of Citizenship, Immigration and Multiculturalism showed his colours when he described the intelligent and highly credentialed young DePape as “a lefty kook”. But beyond Parliament Hill, many Canadians have been deeply moved by Brigette’s courage and conviction. People of all ages are praising Brigette for taking a stand. Like-minded youth in particular have been quick to call Brigette their hero. Not surprising. Brigette’s quiet, peaceful protest comes at a time when many young Canadians are disengaged from the political process and/or deeply disillusioned with a system that allows our country to be governed by a political party elected by less than half of its voters and committed to the destruction of much that Canadians have struggled to build over many long decades. Like Brigette, many youth across the world are wondering how they can make a difference. They are taking action, exercising their democratic rights and expressing their views in creative ways because they do not have faith in their governments to implement policies that will create the kind of just and equitable world they believe to be possible. Let’s face it, they don’t need to look too far to see the impact of political decisions. Growing social and economic inequality is pervasive, its consequences will be exceptionally damaging, and environmental destruction is threatening the world that they will inherit. Brigette DePape is a young woman who passionately believes we can create a world that is more just and equitable. She is smart, hard-working, energetic and community minded. She is respectful yet not afraid to think critically and express her views. She’s done all the right things in her young life and the zest in which she lives it would make any parent proud. Her award of a Loran Scholarship, an honour awarded to students who have shown excellence in academia and community service, is evidence of her competence. In a world where success is measured in terms of personal wealth and individual pursuits, Brigette and other youth like her should be commended for looking beyond their individual careers as they fight for a better world. Brigette was fortunate to have found herself in an unusual position – privileged yet powerless. On the one hand, she was honoured to have been selected as a Senate page, a position difficult to attain and one coveted by students dreaming of political careers. But for someone with Brigette’s integrity and passion for justice, the excitement of being a page soon wore thin. At some point she realized that it presented a creative way for her to turn a completely powerless position into an opportunity to express her political views with the hope of raising awareness and mobilizing toward change. In an age when newspapers have the power to influence voters by endorsing politicians who put business interests before public interest; in a society where a political party is given a majority government in spite of demonstrating its disregard and disrespect for the parliamentary process; and in a society where the acquisition of a hockey team gets more media attention in one day than many issues of significant public relevance get in a decade, Brigette selflessly and brilliantly played the card that she had available to her, in spite of the unknown consequences to her as an individual. In this single act of peaceful defiance, Brigette has become a symbol of hope for many who are concerned with the direction the Harper government may try to take us in. She has sent a signal to her generation, and to all of us, that we have an important role to play in changing that course. And she has re-energized the progressive but often cynical members of her parents’ generation to continue to press for change. Brigette stepped up when we needed a shot of hope and optimism. Perhaps it is because I know Brigette and have a high regard and respect for her sincere desire for social, economic and environmental justice that I have been so deeply moved by her courageous act. Perhaps this is why the image of her standing in the Senate is the most powerful image of political protest in Canada in my recent memory. Notwithstanding, I believe that those who think that Brigette’s action will be a blip in history, written off as some silly act of youthful defiance, are wrong. We have seen throughout history the power that single acts of non-violent civil disobedience can produce. Brigette DePape has gone viral. Her image is being plastered on walls, websites and facebook pages across the country. 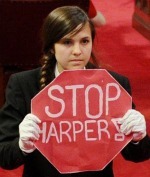 Her moment in the mainstream media may be over, but the image of Brigette and her “Stop Harper” sign will continue to inspire her generation and others who share her desire for a more just and democratic society. Shauna MacKinnon is the director of the Canadian Centre for Policy Alternatives – Manitoba. Brigette’s column about unequal access to opportunity rings true for me. I used to live in West Broadway and would travel over to River Heights in order to play pick up hockey at the rink there. Broadway CC had one ice surface, if we were lucky, that was hand cleaned; River Heights CC had multiple surfaces over which ran a Zamboni. Keep speaking truth to power, Brigitte! The only one person with silent demonstrate with the whole country’s attention. This is the only one person in our period of time. Ms. DePape had done amazing job.